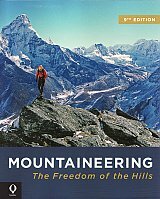 For nearly 60 years it's been revered as the "bible" of mountaineering and now it's even better than ever... Mountaineering: The Freedom of the Hills is the text beloved by generations of new climbers the standard for climbing education around the world where it has been translated into 12 languages. For the all-new 9th Edition, committees comprised of active climbers and climbing educators reviewed every chapter of instruction, and discussed updates with staff from the American Alpine Club (AAC), the American Institute for Avalanche Research and Education (AIARE), and the Access Fund. They also worked with professional members of the American Mountain Guides Association (AMGA), to review their work and ensure that the updated textbook includes the most current best practices for both alpine and rock climbing instruction. From gear selection to belay and repel techniques, from glacier travel to rope work, to safety, safety, and more safety, there is no more comprehensive and thoroughly vetted training manual for climbing than the standard set by Mountaineering: The Freedom of the Hills, 9th Edition. Significant updates to this edition include: New alignment with AAC's nationwide universal belay standard Expanded and more detailed avalanche safety info, including how to better understand avalanches, evaluate hazards, travel safely in any terrain, and locate and rescue a fellow climber in an avalanche Newly revamped chapters on clothing and camping All-new illustrations reflecting the latest gear and techniques created by artist John McMullen, former art director of Climbing magazine Review of and contributions to multiple sections by AMGA-certified guides Fresh approach to the Ten Essentials, now making the iconic list easier to recall.